Notes: Based on the manga by Tachibana Higuchi, published by Hakusensha. When her friend Hotaru Imai goes to a secretive school run by the government, Mikan Sakura resolves to see her. The problem is that, difficult as it is to get into the Alice Academy, it can be even harder to get back out. "Alice" here is a term for either a "wild talent" itself or its owner; it can be an extreme version of some more familiar gift such as ones for art, music, or invention (the latter is Hotaru's); it can be a paranormal ability such as telekinesis, levitation, or teleportation; or it can be something weirdly idiosyncratic, that in some cases seems to be of little practical value. 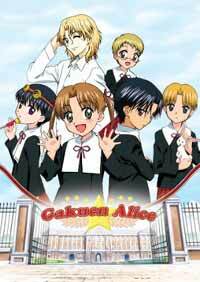 In this series the Japanese government is trying to gather together all the kids possessing "Alices" under the roof of the Alice Academy, and Mikan, after finding her way into the Academy in search of her friend, is allowed to stay there because it turns out that she herself HAS an Alice, but it seems at first to be one of those impractical "useless" ones. Because it seems so worthless, and because she is initially disliked by a student whose fan following is quite willing to bully other students their "idol" doesn't like, Mikan is subjected to some rough treatment for a while. There's also a teacher who just doesn't seem to like her, though we don't find out just what his issue is for a while. Mikan is drawn quite a bit like a younger version of Yumi from Maria Watches Over Us, and the similarity surely transcends coincidence by the use of Yumi's own seiyu, Kana Ueda, for Mikan. Mikan has much of the Yumi personality as well- innocent, exuberant, earnest, and totally devoted to another female. The show didn't get the seiyu of Yumi's "big sister" Sachiko to play Hotaru, but it got the next best thing- Rie Kugimiya, the one who voiced Toko, Yumi's "little sister." Hotaru isn't so much like Toko, though; with Hotaru's usually emotionless delivery and penchant for inventions, she reminds one much more of Kisaragi from Happy Lesson. Her usual reaction to Mikan is indifference, or annoyance with Mikan's impulsive behavior; but it becomes obvious over the course of the show that she has a lot of hidden affection for Mikan, no matter how many times she declares her an "idiot." When she first arrives at Alice Academy, Mikan meets two people who are central to the plot. The first is Mr. Narumi, a curiously androgynous teacher whose Alice is the power to charm anyone (save one person) with his pheromones. The other is Natsume Hyuga, a surly kid (and the one with the fan following) who is bitter about what he says is the exploitation of the students by the school. It turns out that the school IS exploiting some of its students- but it's also protecting them, and the dual nature of the Alice Academy is the springboard for some much more serious sub-plots that result in a couple of crises for the students. But this darker storyline is not really my favorite part of the show. There are times when the show frankly disappointed me a little. Some things LOOK like they belong in a kid's show, and by that I mean a show FOR kids, not a show ABOUT them. The various robots used at the Academy, the giant baby chick, and the look of some of Hotaru's inventions, all fall in this category. There were some originality issues too. A violent teddy bear? Even Girls Bravo had those, though when we finally heard it, the story of the teddy bear's creator actually turned out to be surprisingly interesting, and even moving. The Alice Academy has a town associated with it, where former students of the school sell all kinds of amazing wares, a concept which seemed to me too close to the town of Hogsmeade in the Harry Potter series. But I really loved the episodes (# 16-20) centered around the school festival. The students with the oddball powers (including Mikan) are considered "losers" by many of the other students, so she resolves to come up with something exciting and original for their contribution to the festival, and I have to admit what they came up with was pretty imaginative. Also during the festival we learn some more about Hotaru, and how much reason she has to appreciate Mikan's friendship; we visit the imaginings of Ruka, a friend of Natsume's who is now also a friend of Mikan's, and see how recent events have changed these thoughts (a simply wonderful visual); and we have an interesting love triangle which is prevented from developing into a crisis by a clever move of Hotaru's. Since this is a Nozomi release, it does have liner notes (here Translator's Notes) that explain many of the Japanese cultural references. I've always appreciated this feature of many of their releases, and really wish other companies would imitate this practice. The perky "cheerleader" number opening the episodes, and the more ballad-y closing theme, are both rather pleasant, as is the series' art in general. Recommended Audience: Mikan does have one “Now I can’t get married!” moment, but since the lead cast is only about 10 years old or so, fan service would be particularly inappropriate. There’s some violence though, so as with NOEIN, the appropriate age group is older than the cast is supposed to be. I’d say 13 and up.